Atlanta-based Roark Capital Group announced Friday it has bought the parent company of collision repairers Maaco and Aero-Colours and several other automotive maintenance brands, including Meineke. The amount of the deal was not disclosed in the Friday news release from Driven Brands, which along with Maaco and Aero-Colours owns Meineke, AutoQual, Drive N Style, Econo Lube & Tune, Merlin 200,000 Mile Shops and Pro Oil Change for a combined 1,500 shops carrying those brands. Maaco itself makes up 490 of those locations. The number of van-based Aero-Colours repairers, who typically provide touch-up and minor cosmetic repairs to dealerships, is unclear. Each van gets about 70 exclusive new-car dealerships, so make of that what you will. Driven Brands CEO Jonathan Fitzpatrick will stay in charge, and the company will remain based in Charlotte, N.C.
All the Driven Brands companies combined do $1 billion in sales, and according to BizBuySell, one crude rule of thumb would be to buy a business for three or five times earnings (which is net revenue, not sales, but you still get the idea). Bradley Mewes of the “Supplement!” collision repair financial blog gives some other ways to value a business here and we elaborate a little more on aspects of that here. However, franchisees own all of these individual locations. 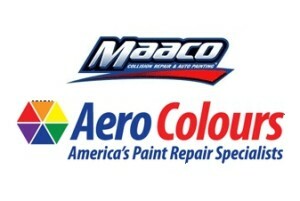 Aero-Colours repairers/painters had paid Driven Brands 7 percent of gross revenues for various services, and Maaco shops paid back 8 percent of gross revenues. Conservatively and crudely estimating all the other brands give Driven Brands 7 percent, the company had been pulling in at least $70 million gross from the billion the auto family sold to Roark had been making. That plus the value of the famous brands themselves would crudely be in play in valuing the deal. Driven Brands had been a subsidiary of Harvest Partners, which like Roark Capital is a diversified private equity firm rather than a company dedicated to a single industry. That means Maaco et al will leave one eclectic family of brands for another; Roark owns Cinnabon, Anytime Fitness, Batteries Plus Bulbs and Massage Envy, among others.